In the original telling of Batman’s origin, the traumatized young Bruce Wayne, days after witnessing the brutal murders of his parents, has committed himself to a path that will become a double life, torn between light and darkness. When he eventually takes on the likeness of a night creature to terrify criminals and to ensure no one else will suffer his losses, he will succeed so well that the being he created leads to an identity crisis of faith—one that might resonate in our own hearts. Weeks ago, the news circulated that in Batman #53, Batman would be declared an atheist. There was little surprise, since Batman is the most self-made superhero in the comic book pantheon, and the one least likely to feel dependent on a supernatural God. But fans were intrigued to hear that writer Tom King was going beyond the implications that Bruce Wayne acknowledges no Higher Power, and exploring the dynamics of how this rejection of faith came to be and its consequences. Yet in a tweet, King himself questioned whether Batman is actually a practicing atheist: “That’s not how I read that comic.” Indeed, the issue ends with a hint that Bruce Wayne is at a crossroads of faith in God versus faith in himself. The three-part story, “Cold Days” (in Batman, issues #51-53)—written by King and beautifully illustrated by veteran artist Lee Weeks, an outspoken Christian—picks up after Bruce has been left at the altar by Selina Kyle, a.k.a. Catwoman, who had decided that marriage would hinder Batman’s mission. Standing on the edge of a skyscraper in his groom’s apparel, abandoned, Bruce quickly reverts to his other identity, leaving any chance of mourning and recovery behind. Investigating the deaths of three young women, he finds evidence pointing to his old enemy, Mr. Freeze. He finds Freeze and viciously attacks him, leading quickly to Freeze’s confession and trial. But then, a twist: Bruce Wayne is called to serve on the jury. He becomes the one “not guilty” vote and questions whether there might be another explanation for the murders. “If we follow the actual facts, take out Batman’s … I don’t know … the presumption of supercompetence. His infallibility,” Bruce argues, maybe they can avoid rushing to judgment based on the Dark Knight’s reputation for always seeing what others miss. It’s obvious that Bruce fears his hasty conclusions may lead to a miscarriage of that which obsesses him, justice, and that Batman’s excessive force had terrified Freeze into confessing to the police. Bruce is at war with his alter ego. Who Am I? What Have I Become? Despite the comic book trappings of “Cold Days,” Bruce Wayne’s journey toward realization of his idolatry of Batman has real-world parallels. It’s painful when we, in our search for peace and fulfillment, discover instead that we are ourselves the source of our anxieties, fears, and conflicts. Like all the little fires we build to light our way, which ultimately cause us to lie down in torment (Isa. 50:11), the light emanating from the Bat-signal, intended as a means of healing, has become a dangerous idol. Even if the people of Gotham didn’t actually worship Batman, Bruce has discovered that he does. Similarly, what keeps me awake at night, or in distress through the day, might be a signal that I have my own dueling identities—the diurnal right-believing identity that finds in myself a nocturnal creature whose desires and emotions diverge from my beliefs. Anger, conflict, and frustration undermine my striving to do right. 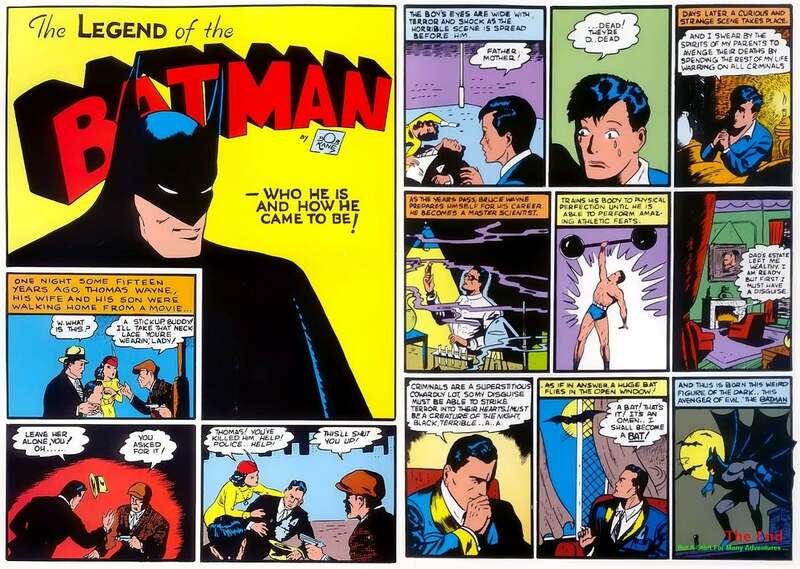 Bruce Wayne’s drive to realize his commitment to justice by transforming his body and mind into the perfect avatar of justice made him more a Nietzschean ubermensch than a servant of righteousness. Now, in his brokenness, he sees how he’s fallen short. Sometimes, in our own dark night of the soul, we finally see how we have made a little god out of a good thing—a calling, gift, or even family and church—and held it, burning, close to the heart, until God shouts in our pain and our eyes are opened. Who is Bruce Wayne? Bruce Wayne is us. Alex Wainer is professor of communication and media studies at Palm Beach Atlantic University. He is the author of Soul of the Dark Knight: Batman as Mythic Figure in Comics and Film.